Texas Rangers had the rustlers pinned down. They had it coming after they raided Widow Murphy's remote ranch. "Robbie, come here," his mother called from the kitchen. Robbie frowned and inched up from the rug in front of the television. "Run over to Mr. Thompson's and borrow 20 dollars." "Yes, and get a move on. It's getting dark earlier. Tell him I'll go to the bank and pay him back tomorrow. Stay on the road." Robbie stopped on the back porch, pulled the beaded light-chain, then pushed the screen door open with his shoe. He saw lights from Thompson's farm far across the prairie. His dad told him the Thompsons' lived a little over a mile away, but now it looked like a hundred. He started down the gravel road. Burnt-biscuit clouds scudded across the sky as the cottonwood trees begin their evening waltz alongside the alfalfa field. The wind hummed in the power lines. Robbie liked to listen to the wind while he waited for the school bus in the morning, but in the dusk it made the hair on the back of his head stand up. He turned off the road, jumped a shallow drainage ditch and walked across the prairie. Earlier that afternoon he played cowboys and Indians with his big brothers in this place. His older brother, Tom, reached into a clump of sagebrush for a stick rifle, and it rattled. They took off across the prairie as fast as they could. 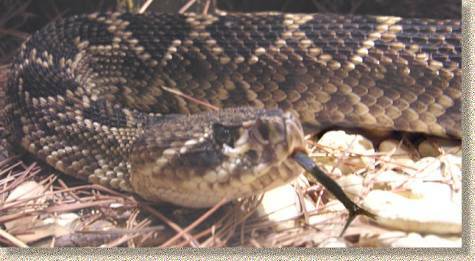 They had been warned that rattlesnakes stayed in the brush, out of the hot sun, during the day. But now the air had cooled. The moon squinted over the Horse Heaven Hills and a lonely coyote started his solo concert in the distance. Robbie carefully walked around the sagebrush and studied the ground in front of him. A small vineyard bordered the orchard. He crawled through an opening in the grapevines and turned toward the orchard. On the other side he saw Mr. Thompson walk from the barn. "They're kinda busy with homework, Mr. Thompson. I came all by myself and I ain't scart one bit. Mom wants to borrow twenty dollars 'til tomorrow. She'll pay you back." Mr. Thompson smiled and took a bill out of his wallet. "Now you be careful goin' back through the orchard -- rattlers come down in the evening to eat the dead-ripe apples on the ground, you know." "Aw, snakes don't eat apples." Robbie studied Mr. Thompson's face. "Do they?" "Then the King Coyote comes along and eats the rattlers." "Coyotes don't eat snakes. Do they?" "A King Coyote will --" Mr. Thompson turned away so Robbie wouldn't see him grin. "You're jus' kiddin' -- ain't ya?" "You said you weren't scared, I thought I'd test you. You best get on home. It's gettin' dark." "Mom said she'll pay you back tomorrow. Honest. G'bye, Mr. Thompson." Robbie trotted toward the orchard, paused and decided to go around it. It's a little longer that way, but I'm not taken a chance, he thought. He followed a path toward the vineyard. As he neared the vineyard he froze -- Rattlers! He took a step back. "Nope, it's gettin' dark an' I ain't scart." Robbie saw the breeze shake the dry grape leaves. It sounded like a whole bunch of rattlers. He went down the row and looked for the opening he came through earlier. He made sure the twenty-dollar bill was crammed in the bottom of his pocket, then started to crawl through the vines. He didn't hear the snake slither toward him from the opposite row of grapevines. The snake's tongue darted in and out as Robbie's head began to emerge. The giant rattler sprang up and wrapped itself around his neck. Robbie used his right arm to fend the snake off and tried to back out of the vines. He let out a shrill scream but the snake held him fast. From the corner of his eye he saw a dark shape run down the row. The King Coyote! The coyote dug its claws into his sides. "Yer all right, Robbie -- let me get this grapevine off from 'round yer neck." Mr. Thompson held Robbie by his sides and put him on his feet. "I saw you go around the orchard and figgered I better watch you -- wasn't sure you knew the way by the path in the dark. Then I heard you yelp. You okay?" "I - I kinda got caught in the grapevines." Mr. Thompson pointed. "You go down this row -- it'll take you right to the road an' you get on up there. I see a light -- yer folks are out lookin' for you." Robbie ran down the row, crossed the drainage ditch and up onto the road. The light grew closer. "I'm here, Mom -- I got the money an' I ain't scart one bit." His mother took Robbie's hand. They headed for home in the flashlight's halo on the road. "I heard a commotion across the way and it worried me." "A big rattler wrapped 'round my neck in the vineyard but I jus' threw him off an' stomped on his head an' while I was doin' that a King Coyote jumped me from behind but I jus' spun around like a Texas Ranger an' socked him on the nose, then Mr. Thompson came along to see what the fuss was all about an' he said he's never seen a rattler that big or a coyote run away so fast." "Next time leave your imagination on the back porch and stay on the road like you're told." Robbie dropped his mother's hand and stopped: "The next time?"